In December 1861, several Norwegian families, led by Andrew Olsen and Tarel Johnson, organized the first Norwegian-American Adventist church in Oakland Township, Jefferson County, Wisconsin. Oakland Township is part of the Koshkonong Norwegian-American Settlement, which includes southeastern Dane County, southwestern Jefferson County, and northern Rock County, Wisconsin. The Olsen, Johnson, Loe, and Serns families were from a rural district in Vest-Agder County, Norway. On March 20, 1850, Andrew Olsen, his half-brother, Halvor Olsen, Ole Hegland Serns, and their families left for the U. S. from Kristiansand, Norway. In 1854, Soren Loe and Tarel Johnson moved to Oakland to be near there relatives. Berte, Andrew Olsen's wife, was a sister of Soren Loe and Tarel Johnson's second wife, Todne. The Loes and Johnsons had emigrated from Norway in the spring of 1849 and originally settled in the Fox River, Illinois Norwegian-American Settlement. 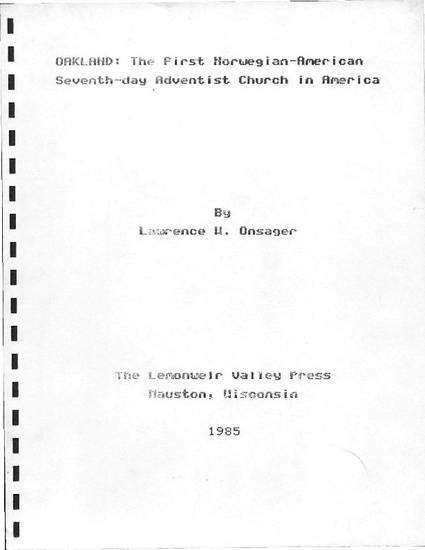 The Oakland Seventh-day Adventist church served as a center from which evangelistic work spread among the Scandinavians in the United States and Europe. Eleven children from the charter members of this church served as Adventist church workers, including O. A. Olsen, who became General Conference President.